It has been cold here in New York lately, making going outside in any capacity very difficult. My apartment, on the other hand, has been sweltering and since it's old-fashioned steam heat, I can't control it. I've been waking up every morning with a headache and feeling dehydrated so lately I've been putting a sauce pan full of water on my radiator to get some moisture in the air. My dad calls it the "cheap man's humidifier." Literally, this is what my life has come to. Beside being super busy at work, constantly stressed out over the current state of affairs in America and trying to figure out how I can help, and working on this blog, I feel like I'm exhausted. But exhausted in a good way! It's only Tuesday but I'm already looking forward to the weekend. I mentioned in my last post that since purchasing a candy thermometer, I've been obsessed with making candy. 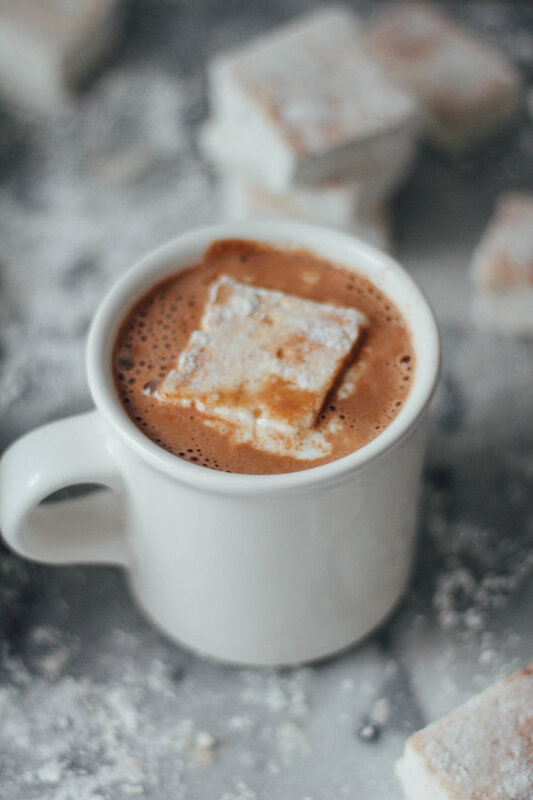 My latest endeavor was these Maple Cinnamon Marshmallows which were surprisingly easy to make (if not a bit time consuming) and went well with the hot chocolate I've been making out of cacao and coconut milk. I've seen so many pretty and colorful swirly marshmallows and next I want to try making those. Happy Tuesday, everyone! Coat the bottom and sides of a 9-inch square baking pan with oil. Then dust the pan with confectioners' sugar, knocking out any excess. Put 1/2 cup water in a large bowl. Add the gelatin into the bowl and stir to make sure all the gelatin is in contact with water. Let soften while you make the sugar syrup. In large saucepan combine the sugar, corn syrup, salt, and 1/2 cup water, and bring to boil over medium heat until sugar has dissolved. Fix a candy thermometer to the side of the pan and continue boiling (the mixture may foam up, so turn the heat down slightly if necessary), without stirring, until the thermometer registers 240°F. Remove the saucepan from the heat and let stand briefly until the bubbles dissipate slightly. With a mixer on low speed, pour the hot sugar syrup into the softened gelatin in a thin stream down the side of the bowl. Gradually increase the mixer speed to high and beat until the marshmallow is very thick and forms a thick ribbon when you lift the mixer, about 5 minutes. Beat in the vanilla and maple syrup. Pour half of marshmallow mixture into pan and sprinkle one teaspoon of cinnamon. Swirl in with a toothpick. Pour second half of mixture into pan, add cinnamon and swirl with toothpick. Let stand, uncovered at room temperature, until the surface is no longer sticky, overnight. Dust a cutting board with confectioners' sugar. Use a rubber spatula to pull the sides of the marshmallow from the edge of the pan and flip it onto the cutting board. Dust the top with confectioners' sugar. Brush a long thin knife or a chef's knife with vegetable oil and dust with confectioners' sugar to prevent sticking; continue dusting the knife as necessary. into squares and enjoy!